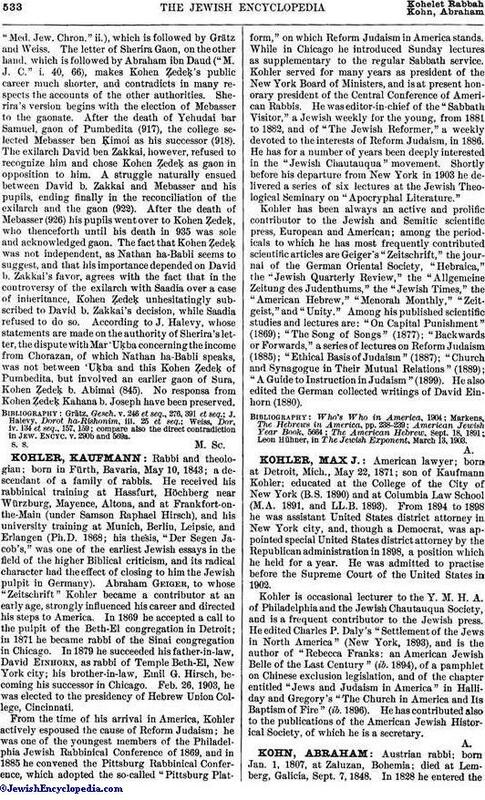 Austrian rabbi; born Jan. 1, 1807, at Zaluzan, Bohemia; died at Lemberg, Galicia, Sept. 7, 1848. In 1828 he entered theUniversity of Prague, where he applied himself to philosophy, while devoting his spare time to rabbinical studies. In July, 1833, he was called as rabbi to Hohenems, Vorarlberg, where he remained for eleven years. Besides organizing various charitable societies, he greatly improved the educational facilities for the young, and introduced many wholesome reforms into the public service. In May, 1844, he accepted the rabbinate of Lemberg. Here in a comparatively short time he opened a well-equipped "Normalschule" of which he was the superintendent, dedicated a new temple, abolished many old abuses, and did not rest until the degrading tax on kasher meat and Sabbath candles, imposed upon the Jewish community by the government, was removed. But while the better element rallied about him, the enemies of culture and progress were actively engaged in embittering his life and in undermining his growing popularity. Impelled by unbounded fanaticism, and encouraged by the lawless conditions prevailing in 1848, they finally concocted a plan to take Kohn's life. On Sept. 6, 1848, a man, hired by the fanatical clique, entered Kohn's kitchen and poisoned the dinner. While the other members of his family recovered, Kohn and his youngest child died the following day. A wearisome trial ensued; but for some unknown reasons it was suppressed. 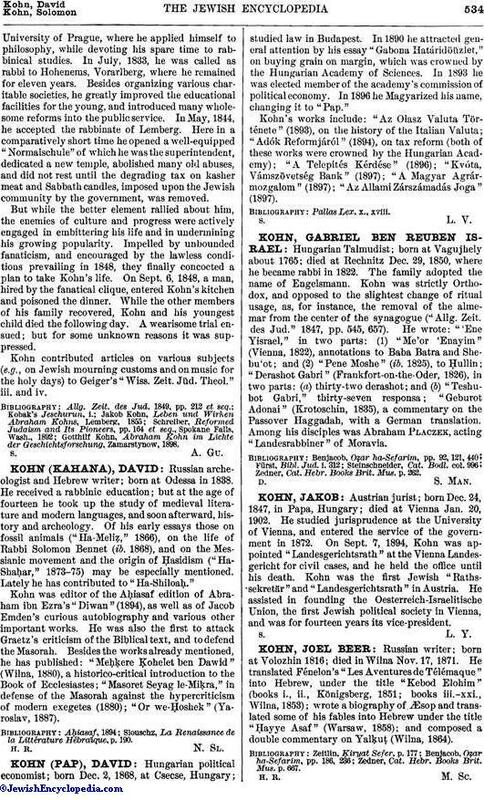 Kohn contributed articles on various subjects (e.g., on Jewish mourning customs and on music for the holy days) to Geiger's "Wiss. Zeit. Jüd. Theol." iii. and iv. Gotthilf Kohn, Abraham Ḳohn im Lichte der Geschichtsforschung, Zamarstynow, 1898.